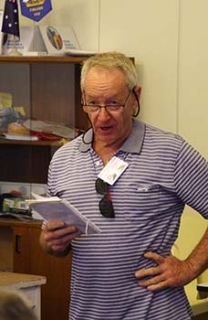 This Week's Speaker is Stan Maley who will speak on the topic "Maitland Park Botanical Gardens"
Guest Speaker – Laurie Croke who is an Allied Health worker at Geraldton Regional Hospital. His particular interest is Australian Military History focussing on New Britain and New Ireland. Before Laurie's main presentation he informs us of his boxing lessons for Jacqueline Stewart to help her defend herself against Terry (insert laughter here!!). Laurie is interested in the story of Rabaul and an author J K McCarthy who served in New Britain during WW2. He tells us that Rabaul was the capital of New Guinea until 1937 but continuing volcanic eruptions forced the capital to be moved to Port Moresby. 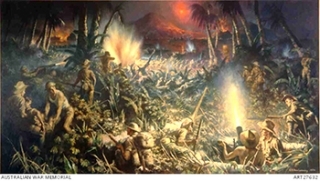 In early 1942 after Pearl Harbour Rabaul was overrun by the Japanese. In McCarthy's book Laurie discovers Alf Robinson a Queenslander who was serving in New Guinea and New Britain who was taken prisoner but escaped and avoided being bayoneted to death. Eventually he found he way back to Australia and re-enlisted and saw more action in the S Pacific on a PT boat with McCarthy. It is on this boat that Robinson dives overboard to save a drowning Japanese soldier. Later in the water he received the Distinguished Conduct Medal for other action helping US soldiers. Laurie Croke decided he needed to see more of this part of the world and travelled to Rabaul. He related the story of the Kokoda trail and the great legacy of the fuzzie wuzzie angels. Laurie wants to help with some community project(s) on Matapit/Matupit Island, he thinks installing water tanks might be the best outcome and is prepared to put his own savings into Rotary to help with such a project. Laurie Dines – What are the dwellings on Matapit Island like? Geoff Wood – Has there been any logistical study to provide tanks? Peter Moore – Has Aus Aid been approached? Laurie Croke makes a further comment about Australian WW2 military leader General Blamey and his comment about … ' … the rabbit that runs...'... and that when Blamey visited a military hospital in NG all the soldiers had a lettuce leaf. Guest Speaker thanks by Clark Scarff.